Aim – Develop writing skills, build confidence among aspirants, doubt-clear sessions, complete coverage of the syllabus. Separate tests for monthly current affairs will be conducted in addition to other tests. There will be total 10 current affairs tests covering current affairs from January 2019 to February 2020 .Current Affairs Test will include 100 questions completely based on recent happenings and important topics in news. Economic and Social Development, Sustainable Development,Poverty, Inclusion, Demographics, Social Sector Initiatives etc. How this course is relevant? This not just a test series but a complete preparation course where you will be given daily/weekly targets followed by test to evaluate your target accomplishment task. 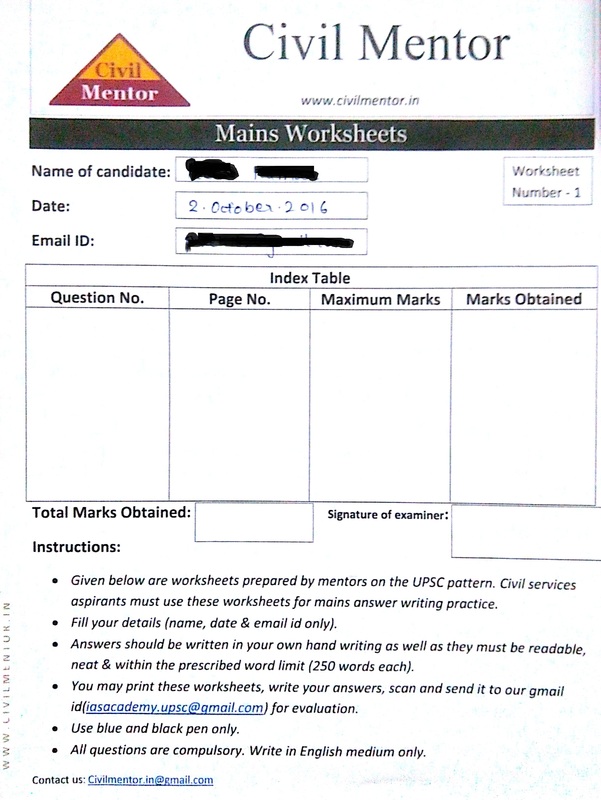 Also you will be provided worksheets for mains answer writing practice. Our mentors will evaluate your worksheets. How to start a particular topic/subject. What to study what not to. How to avoid negative marking. Help you in identifying your weak area and provide required guidance. These all sources will be covered in this course. Complete coverage of syllabus of preliminary examination as well as Mains examination. Currents affairs of 2019 and 2020 covered separately. Dynamic as well as static syllabus of Mains GS paper I, II and III will be covered. Daily Targets, Weekly targets, Study source and performance check. Each student will be provided a mentor for instant guidance. Will you be able to download Tests in PDF? Yes, one could easily download completely solved (with explanation of each answer) tests in pdf. How do we conduct Tests? We have made a separate web portal (http://iasacademy.civilmentor.in/) so that aspirants can access our articles without any sort of distraction like advertisement, online chatting, etc. + our web portal is mobile friendly. It is 24 x 7 accessible via laptop, computer, tablet, mobile etc. You will be provided an email id (Only for subscribers) through which you can contact us any time, we will reply you within 24 hours. Tests will be conducted online on http://iasacademy.civilmentor.in/ under the head “Subscriber’s Portal”. How this web portal works? Web portal will provide you a real time exam atmosphere where exam will be conducted online. Timer will start as soon as you click on start test button. There will be 100 questions. 2 marks will be rewarded to every correct answer. There will be negative marking as 1/3 of the mark allotted to each wrong answer (same as UPSC pattern). You can appear for the test as many times as you wish. 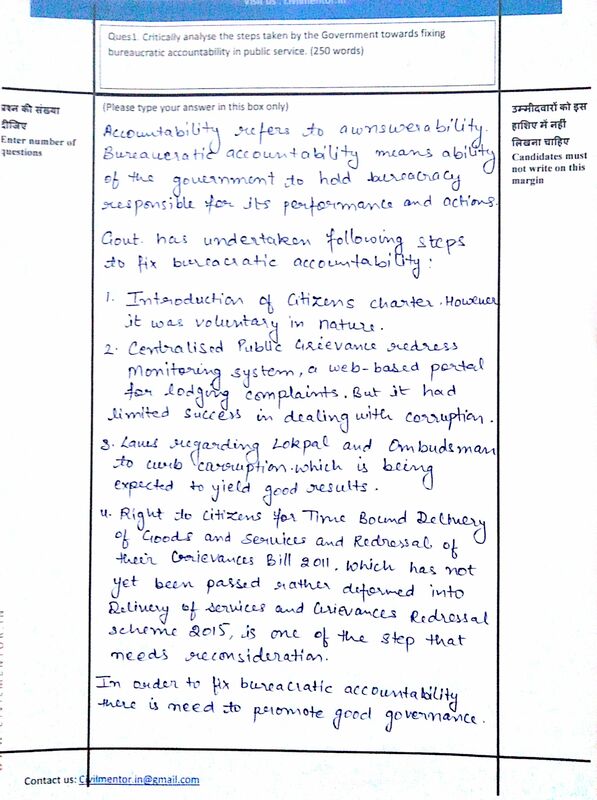 Performance report will be generated after completion of each test. You will not be provided self prepared notes. We do not want to limit your preparation to our notes claiming them as best notes like every other coaching institute, rather we will help you to prepare your notes. Handouts may be provided by our team if we find any topic not covered in any source or students finding difficult to understand from the given sources. How to enrol for the course?